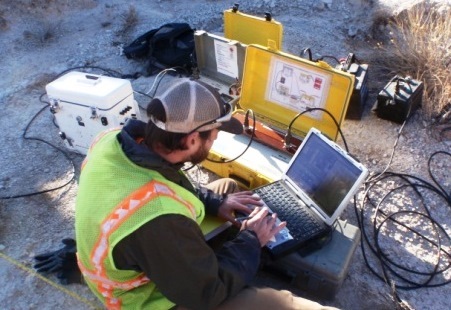 Geophysical services are often an essential component in solving and preventing problems in mining, engineering, geotechnical, and environmental cleanup projects. In practice, the successful use of geophysics involves both sound science and creative problem-solving. and honest about the contribution of various geophysical data to your need. Getting useful results depends on the knowledge and experience of your geophysics provider, the appropriateness of the method and equipment used, and how well the question lends itself to a geophysical answer. More than one method may be needed and multiple parameters measured to provide actionable information. Ground-truth reference points may be needed to best interpret the geophysical data. Specifying what methods and equipment to use is a second-order step, after determining what data will give you the most relevant information and be obtainable given the site. For this reason, issuing an investigational Request for Proposal or a simple purchase order for consulting is often the best first step. These pages contain an overview of the geophysical survey methods in which Zonge has extensive experience and which may be proposed to solve your underground problem. All are common industry practices but are applied differently by different providers.